Lytham Town striker Gareth Moore, 22, was incensed at a tackle on a team-mate and went on to commit several “pretty disgraceful” assaults on players from the West Lancashire League rivals. The sports marketing employee was then heard to bawl: “Who’s next? 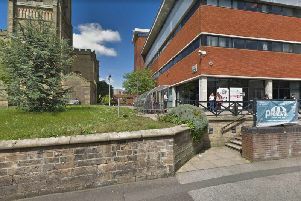 One of his victims suffered a broken nose during the game on February 25, which had to be abandoned, Preston Crown Court Court heard. Moore had a previous conviction and a caution for two drunken nightclub assaults in 2010. His problems were said to have begun when he lost his scholarship in the United States after he was caught with a partner in his room and had to return home. Moore, who works for Manchester-based Eleven Sports Media, was arrested and told officers he acted in self defence. He pleaded guilty to assault occasioning actual bodily harm and two common assaults on the day of his scheduled trial last month. Dave Ryan, defending, said Moore, of Kent Road, Blackpool, was a hard-working young man who had a promising career as a footballer. Moore received a 12-month term, suspended for two years, was ordered to perform 140 hours of unpaid work and observe a six-week curfew between 8pm and 6am. He was also told to pay £750 compensation to one footballer and £75 each to the other two footballers. Moore now faces a lengthy ban from any form of football, applicable across the whole of the UK, after he was charged by the Lancashire Football Association with bringing the game into disrepute. Meanwhile, a spokesman for the Manchester-based sports marketing firm Eleven Sports Media, where Moore has worked for the past five months, said he regretted what had happened. He said: “Ever since Gareth came here he was very open with us about the incident. “Each individual deserves a second chance, and that’s certainly what we want to give Gareth. “This was an occurrence Gareth deeply regrets. “If we felt like he had anything like that in his personality we would not have employed him, but we believe Gareth will prove to everyone that something like this will not happen again. “He has certainly not taken this situation lightly, and yesterday his overriding emotion was not one of relief. “He deeply regrets his actions and is very sorry about what happened.